With sweeping vistas of the Front Range, The Denver Tech Center is the city’s hub for business and economic trading. Shining brightly among the sea of office buildings is Clutch Design Studios’ latest project. Slated to open Fall of 2018, 50 Fifty is a Class AAA, 12-story tower with 185,000 SF of elegant design elements and world-class amenities. Our client approached us with the directive: “I’m not interested in designing just another building.” This set the stage for our team to innovate. Inspired by the client’s love of sailing, the exterior evokes a feeling of looking over the edge of a ship to see the wake dissipate into the horizon. Inside, the design brings visitors “onto the ship” recreating the experience with a variety of marine-inspired materials, patterns, and finishes throughout. The integration of natural light throughout the building—both interior and exterior—is a signature feature of 50 Fifty. 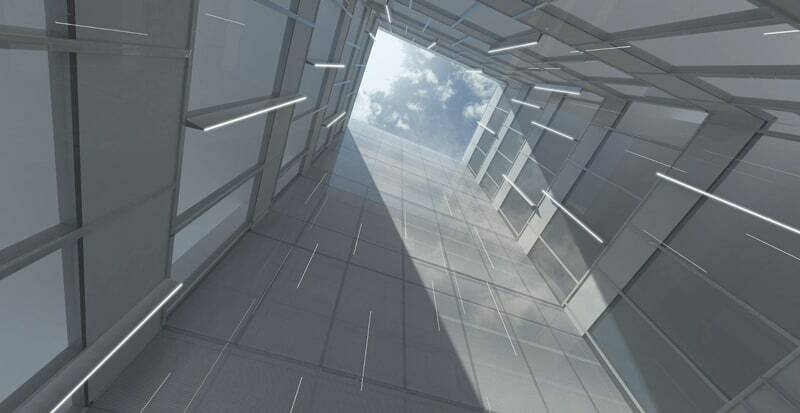 In traditional office tower design, the interiors rarely get natural light. Clutch solved this common challenge by integrating two energy efficient East and West lightwells that illuminate almost every corner of the interior, including the restrooms, which have frosted glazing glass to let the sun shine in. 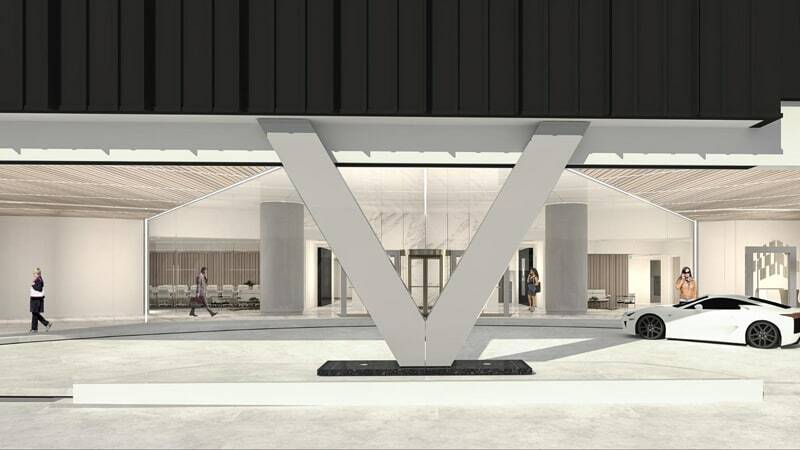 High-tech glass on the exterior creates an almost invisible boundary between the interior lobby and the exterior porte-cochere. As a result, the main lobby not only engages the tenants within the building, but also engages passerby on the street. 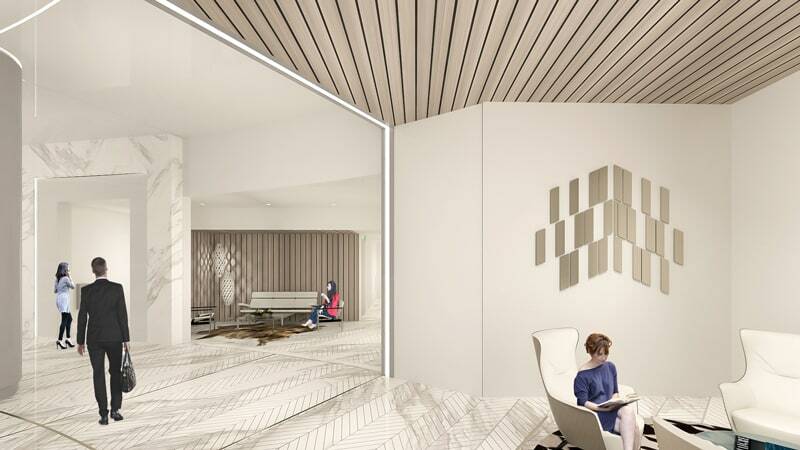 Lobby lighting elements inspired by ocean wind current patterns suggest a strong sense of motion against a backdrop of chevron marble floors and wood accents. Just as every project has its challenges, 50 Fifty was no exception. Our biggest hurdle was creating a remarkable lobby within a small footprint. The space wasn’t large enough for ample seating or restaurant, so we carved out purposeful areas to create a sense of place for those waiting for clients or an Uber. 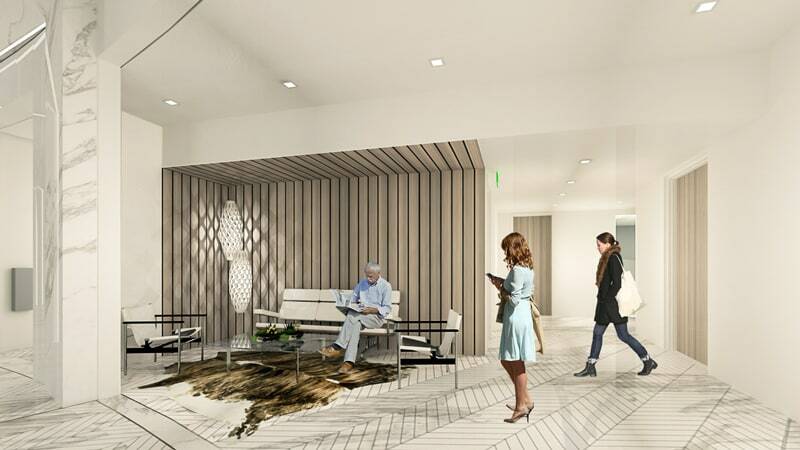 Throughout the design process, we designed several iterations of the lobby, and the final design and materials create a dynamic experience, utilizing a minimal palette that makes a big impression. 50 Fifty is scheduled to open in September 2018. Please follow us on social media and sign up for our newsletter to stay up-to-date on the grand opening date.